ABSTRACT: The term “FinTech” has garnered significant hype, with segments like electronic payments and banking garnering attention across the investment landscape. However, the convergence of Social and FinTech is arguably among the most fragmented and unpredictable segments and currently, no major players are leading the market. 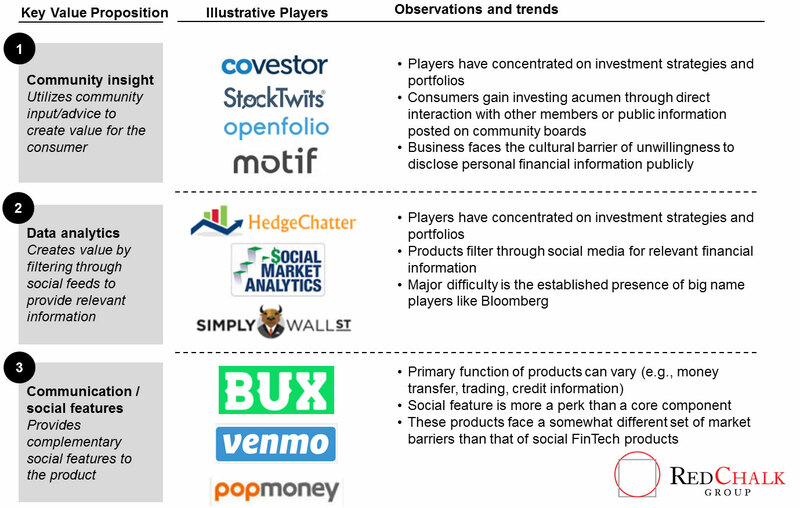 We explore Social + FinTech. Naturally, the question arises – what is Social + FinTech? Unlike pure-play social, which simply have community or social based features, P2P systems (e.g., Square, Venmo) and marketplaces (e.g., Amazon, Kickstarter) leverage social as a means of communication – but not as the primary functionality of the product. The value of the convergence, thus, must not only 1) afford communication capabilities and the ability to create “community,” but also 2) create scalable value from such user communications: ultimately, ease of access as enabled through digital platforms and mediums would afford consumers key inputs for financial decisions be they consumer purchase trends, investment strategies, or other social-driven content. See Exhibit 1. The obvious requirement of a successful FinTech social player is the development and maintenance of a sizeable community. Just as important, the community must be comprised of diverse participants and varying degrees of practice familiarity in order to provide meaningful insight and data for the average consumer. These conditions best fit the complex nature of investing as indicated by the numerous investment platforms emerging in the FinTech landscape. Players like StockTwits and Covestor utilize input from participating investors, traders, and entrepreneurs to create insight available for consumers. Then, there are players like HedgeChatter recreating funnel filtering analytics programs similar to Bloomberg, absorbing mass amounts of data feeds from many sources and providing the most relevant information requested. Entrants must be wary of becoming over entrenched in the social portion of the industry and ensure some degree of unique data creation that consumers can access. In 2013, financial information services company Markit introduced its cross market communication platform, supported by multiple banks, in order to compete against Bloomberg. However, the company’s messaging service’s divestiture within the next year exemplifies a case of overdependence on communications that FinTech social players should take note of. Like the majority of FinTech markets, the largest barriers are regulatory demands imposed by FINRA and government entities. Alongside regulatory demands, a unique barrier arises from the social factor of the market. Culturally, financial planning has never been a topic to be heavily publicized in social terms and every online community, FinTech social certainly being no exception, requires proper curation in order to develop legitimacy for attracting new members. However, the constant arrivals of new VC backed players indicates a degree of affirmation behind the market. 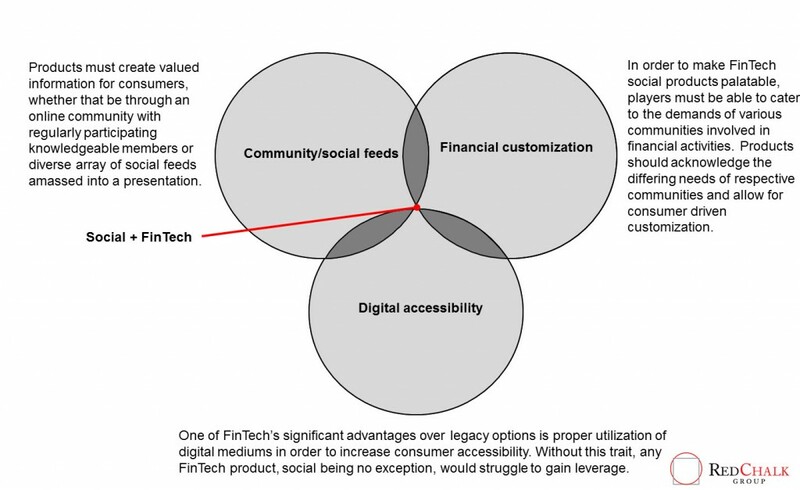 While social remains a key nascent segment within FinTech, strategies that successfully balance elements of digital, community incubation, and custom offerings will afford those willing to bear the long term challenge, expansion opportunities and a potentially leading position within a fragmented market. Aside from investing, what other financial practices can appropriately resource communication/social interaction means to create attractive benefits for consumers? What kind of additional incentives can FinTech social players offer in order to create and maintain their online communities and interactions? For FinTech social players focusing on investment platforms, is there prioritization in the different types of financial assets? What partnerships/agreements do FinTech social players need to prioritize in order to create momentum within the overall financial ecosystem and how long is the potential timeline? How can smaller players allocate their revenue and distribution for growth in order to manage their burn rates while simultaneously integrating their communication aspects with data value creation?